OMG...has it REALLY been over a year and a half since I wrote anything here?! I just got an email from a cousin who mentioned this blog and at first I didn't even know what the hell she was talking about.Guess I've been busy with the family and work. Not to mention all of that critical facebooking that I do. 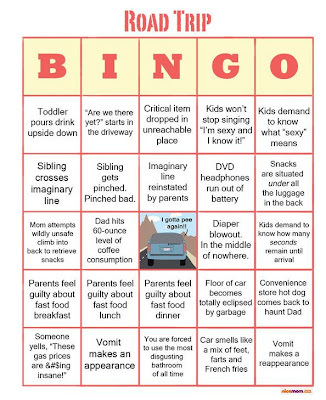 We had two massive roadtrips this summer, which made me think about playing Bingo for the first time in my adult life. My personal favorite box, "Car smells like a mix of feet, farts and French fries." I've never read a more apt description.